To clear up confusion, when I’m discussing Hybrid mattresses they are all going to have innersprings or coils that are surrounded by some type of foam for extra comfort. I have heard of other people referring to mattresses with two types of foam as hybrid. Not me… it has to have some form of coils in it to get into my best hybrid mattress category. I’m currently sleep testing the new DreamCloud hybrid mattress, and it is amazing! What I love about hybrid mattresses is that they combine the soft comfort of a memory foam mattress with the stability of pocketed coils. The best ones that I have sleep tested manage to hide the feel of coils from you, and manage to conform to my adjustable base. There is foam on the edges, so you can’t feel the coils. Why is DreamCloud the Best Hybrid Mattress? The DreamCloud has taken over our top spot in the hybrid category. You simply can’t find a better quality 15″ mattress at the same price as the DreamCloud. This is an 8 layer hand tufted mattress with a cashmere cover. I flipped it over on to the underside of the mattress and was surprised to find that the back cover is as nice as the majority of mattresses that we test. Of course, you won’t flip it and sleep on the wrong side, I’m just pointing out that they paid attention to the little details when constructing the DreamCloud. I have had a hard time separating the next 7 hybrid mattresses. I could make the case for any of them to be in the second or third spot. This is the softest of all of the hybrids that I have tested. Which is a great thing for someone small like me, however this likely isn’t the best choice for the larger folks out there. This is Leesa’s answer to giving a luxurious bed to the heavier folks out there. When you look at it, the mattress screams leesa, but it is unique enough that they didn’t just call it the Leesa hybrid. The Aurora has a cool to the touch cover and is pretty soft for all of the support that you receive from it. The Saatva may be the best value in the group. At under $1,000 with their free white glove delivery it makes a strong argument to get to the top of this list. I’m still sleep testing it so it may make a move higher on the list in the next few weeks. Update for 2018, Brooklyn Bedding added pocketed coils to their signature/#bestmattressever. This caused me to pull my Aurora out of storage and test it for a bit as well. I found that I liked the new version of the BME more, so I flip flopped them in the rankings. What this means is the best hybrids under $1,000 are close between the BME and the Tomorrow sleep. If that’s your budget and you are trying to decide between the two, the largest distinction is that the BME is a bit more firm than the Tomorrow Sleep. These three are really so close that I know I would give you different picks given different questions. There is no great way to separate these three hybrids so I decided to draw questions from a hat! This mattress combines the most innovative copper infused foam on the planet and the support of high quality individual coils with extra edge support, The Alexander Hybrid Signature Series is by far the most comfortable mattress we have tested, usually when we are done testing we start the process of sending our mattresses to storage, not this one yet! we will be holding on to this baby for a while. Update, Nest Bedding has added handles to the Alexander Signature Hybrid, so they got a little ratings boost today. More about the Alexander Hybrid Mattress, it features Thermic Phase Change Cooling Fabric, well not just this one but on all Alexander Hybrid Mattresses! Now that’s COOL, literally. 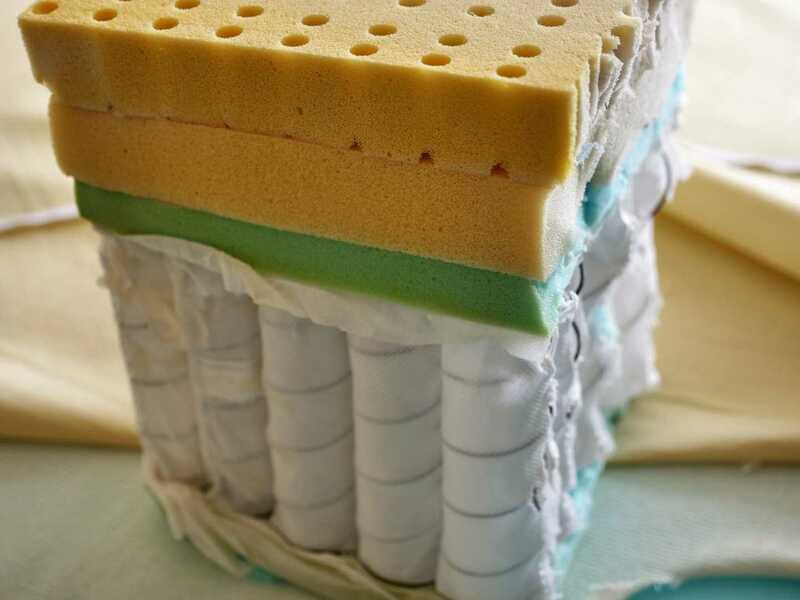 Take a look on what’s inside this mattress. We ordered the Dual Comfort Mattress and loved playing around with this one, taking a quiz, answering a little questionnaire on our sleeping preferences and voilà, we created our very own customized bed! how fun is that? but it’s not over yet. Is it accurate? DRUM ROLL… Yes it is. DreamCloud just reduced prices by $200 for 2019. This means that a queen size can be acquired for only $1,199. All of these mattresses are eligible for an additional $25 off from me!